The High Capacity Optical Transmission Lab facilitates research on innovative optical fibers and signal processing techniques to enable transmission of ultra-high capacity. With the plethora of internet applications growing, the demand for network capacity keeps on exponentially increasing. If the network is not adapted, the abundance of data will eventually clog it up. To prevent this, an augmentation of the optical network which forms the backbone of the internet, is required together with new methods of data transmission. The High Capacity Optical Transmission Lab facilitates research that enables innovation in this field. TU/e scientists working in this laboratory employed components and sub-systems including a new type of optical fiber to transmit data - for the first time - at 255 terabits per second: more than twenty times the capacity required to transmit data with respect to conventional optical fibers. This new fiber type differs from conventional fibers in that it has not only one but seven optical cores through which light is transmitted. In addition, light is not transmitted in only one mode (as in conventional single mode fibers) but in 3 modes. This remarkable result was published in 2014 in the prestigious journal Nature Photonics. In order to transmit data via an optical fiber, the electrical signals sent from our smartphone to a base station or from computers to a datacenter must first be aggregated at high capacity points in the network and converted into light signals before transmission. The High Capacity Optical Transmission Lab develops innovative data packing techniques also known as modulation formats to maximize the efficiency with which this can be done. Besides, the laboratory is one of the renowned leaders in the development of sophisticated algorithms for digital signal processing. The laboratory has state of the art equipment for measuring the transmission capacity of various types of optical fibers. Using state-of-the-art real-time oscilloscopes, for example, the researchers can capture 160 billion samples per second. 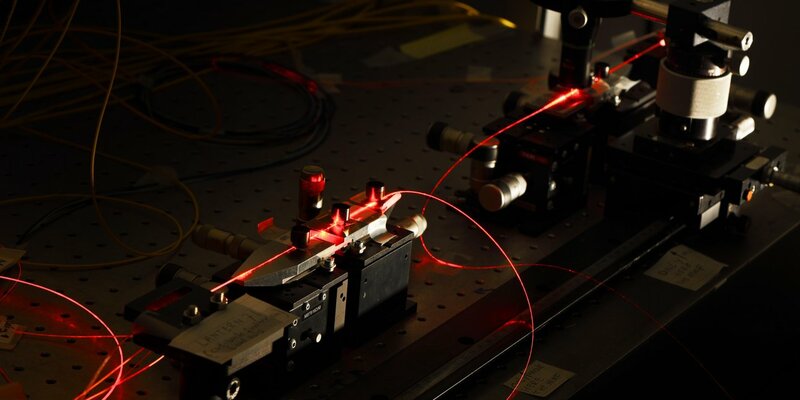 This enables them to measure precisely what is happening in the optical devices and fibers. The laboratory itself constructs various components and sub-systems, such as optical signal amplifiers. Likewise, techniques for combining and multiplexing various optical channels in a new, innovative optical fiber make the laboratory unique in the Benelux region. The TU/e scientists working within the Electro-Optical Communications Group cooperate in the laboratory with various universities and research institutions located both within and beyond the Netherlands. Locally placed, global market leaders in few and multi-mode fibers such as Prysmian Draka (Draka Comteq) and photonic component start-up companies such as Effect Photonics and VTECH also use the facilities. External parties interested in working with these facilities should contact Dr Chigo Okonkwo. The CMEM offers unique facilities for the study of soft materials and uses the knowledge gained to develop synthetic materials. The CWTe facilitates research on wireless systems and antennas, raising the Internet of Things to a higher level. The Darcy Lab offers unique MRI facilities specially equipped for researching the properties of technological porous materials. The Equipment & Prototype Center (EPC) makes custom experimental setups and prototypes for various fields of research. In the Future Fuels Lab scientists are researching green fuels and cleaner combustion methods for engines. ICMS/Lab facilitates the development and characterization of innovative materials from a molecular perspective. The Laboratory for Cell & Tissue Engineering facilitates culturing of autologous tissues across the full spectrum of the research field. The Microfab/Lab facilitates the development of new micromanufacturing technologies for use in life sciences applications.